1500 times. That is the number of times I died before completing the Nicalis platfomer, VVVVVV. This is one of those rare titles that has you loving it one minute, and then the next you hate it for its unforgiving ways. The game’s story has you playing the role of Captain Viridian, whose ship has entered a “dimensional interference,” from which the crew escapes via a teleporter. 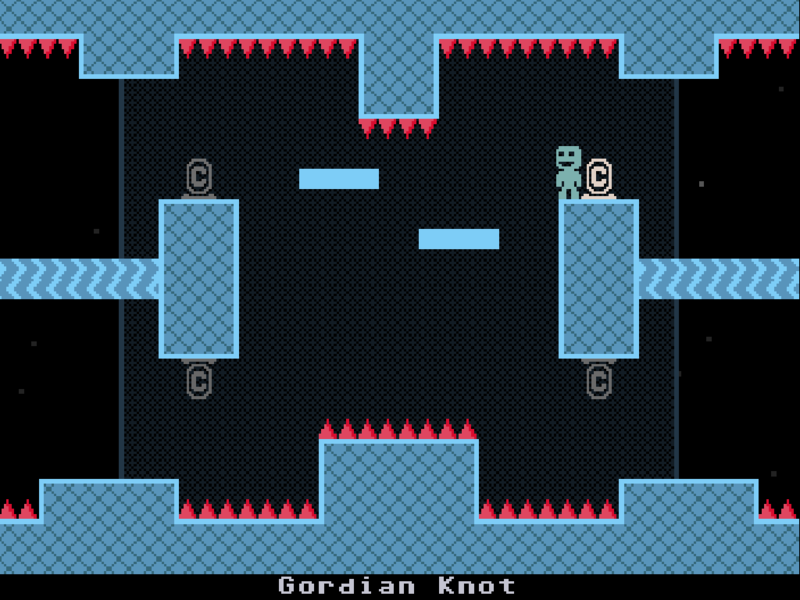 However, when the Captain returns to his ship, he learns he is trapped in another dimension known as the VVVVVV. The crew had been scattered throughout this dimension and it is up to the Captain to save them. The graphics are about as plain as they can be. I would like to call them 8-bit but I do not really think they even make it that far. Think more of C-64 graphics and 8-bit lite. I would say the designers did this on purpose because the loading screen looks like an old C-64 cassette tape booting up; yes guys, they had games on cassette tapes back in day. Further proof of this lies in that the icon on the 3DS menu is a cassette tape. Although they are not flashy, the graphics serve this game well. This game offers the 3D feature of the 3DS, though I did not care for it myself as I personally don’t like any of the 3D stuff on the console. It is optional and if you choose to get this one you may want to try it out for yourself. This game has a very catchy 8-bit chiptune soundtrack. This is good background music to the cries of pain, sorrow, and heartbreak that this game will provide for you time after time. The soundtrack which is composed by Magnus Pålsson (also known as SoulEye) is one the best I have heard in years. You can purchase the full soundtrack from his site here. You can also stream the various tracks from the game there as well. There really are not many sound effects to speak of other than the death blip which you will hear in your sleep after playing this game for long periods of time. The gameplay is where this gets really interesting, to say the least. You cannot jump; instead, you must rely on switching gravity, which will make your character stand on the floor or float up to ceiling. You will use this to avoid spikes and many other dangers that face the good Captain. 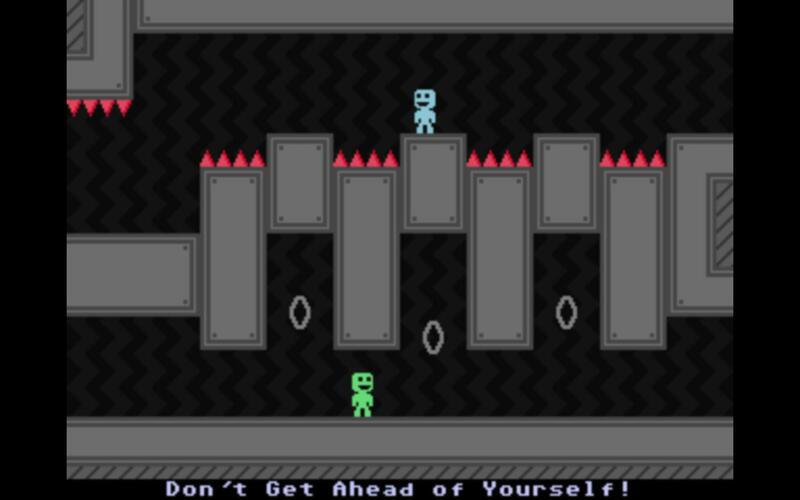 As the game progresses, they add more and more mechanics into the mix such as moving floors, floating platforms, or rooms that when you touch the edge will send you to the other side of the room. Mix all these things together and you have a crazy platforming experience. There are wide-open areas for the player to explore as well. You can also collect 20 trinkets that spread throughout the world, which will unlock some bonuses on your ship. Due to fact that if you touch any hazard you die, the game has lots and lots of checkpoints; so when you die you spawn back there. The game offers a few different play modes, though some of these will not unlock until after you complete the main game. They include time trials, some user-created levels, a flip mode (this flips the whole game upside down), and many other features. You can spend hours trying to get a better time on the time trails or trying to complete some of the user levels. They are just as unforgiving as the game’s original levels, if not worse in some cases. In closing, I have to say I had a blast with this game. It was very frustrating at times due to its crazy difficulty level, but with that comes a certain satisfaction upon completing a hard level or room. I honestly haven’t felt this in a really long time as today’s games are much easier than the games of yesteryear. This game may not be for everyone; if you get discouraged really easily or do not really care for platform games I would advise you to stay away from this one. 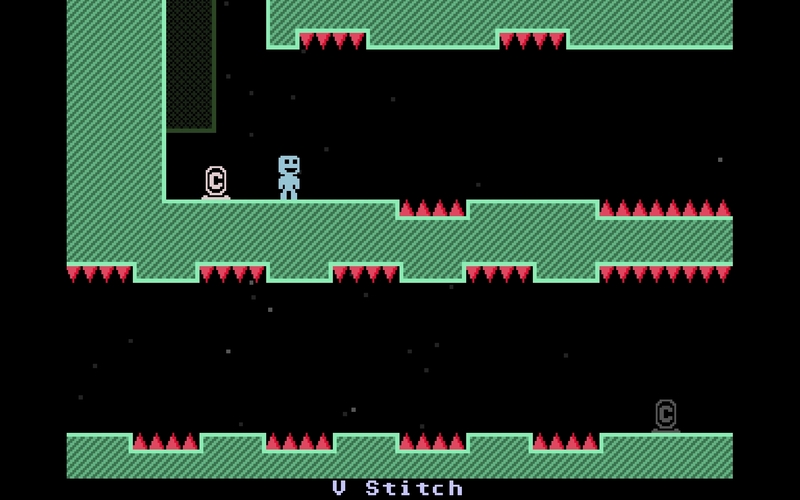 But if you do like platform games and are looking for a challenging game to fill your hunger, VVVVVV is right up your alley.